A trip to the hills is never complete without stacking up herbs from the “nature shops” that sell the local produce. Sometimes, we even stop by the fields where herbs are being grown. Villagers are always welcoming and generous to let us pluck fresh herbs, thereby letting us experience the exhilaration of plucking and then shade drying our precious booty at home. The home stay in Munsiyari where we spent some time last month had a small patch by the brook where peppermint flourished bountifully. We had endless cups of peppermint tea in the morning after long walks. It was like an elixir. We also plucked a lot of oregano from there. Of late, we have being enjoying oregano in our soups, veggies, stews and breads. 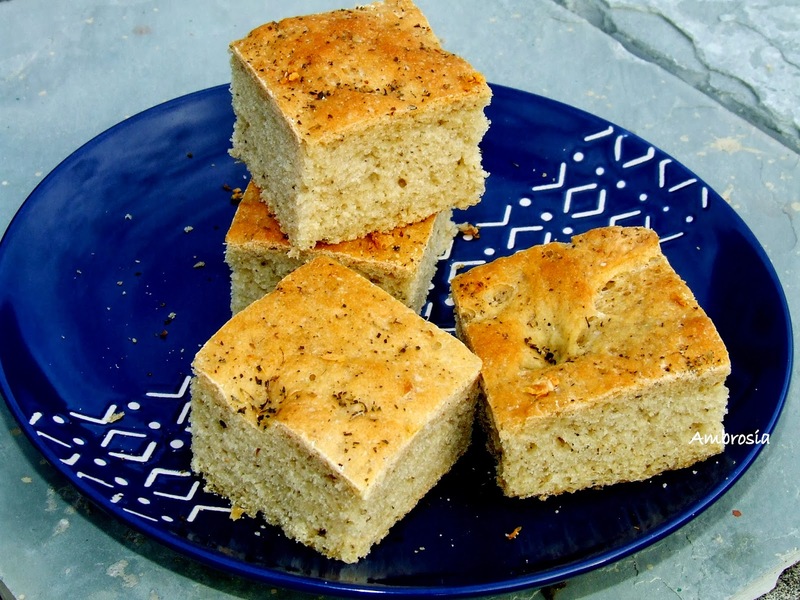 Used oregano in Garlic Focaccia last week. The combination was great. The bead had strong flavor of garlic and lovely aroma of oregano. Add half the quantity of minced garlic. Add warm water and knead for 10 minutes till the dough becomes smooth and elastic. Oil the baking tray, add dough, and stretch the dough to a rectangle (8 inch x 5 inch). Dimple the dough about a dozen times with the tip of your finger pointing straight down. Leave for 30 minutes. When the bread has risen well, drizzle the remaining olive oil, sprinkle the remaining minced garlic, oregano and salt on the bread. I can so understand the joy of relishing nature's fresh bounty..I can imagine the fun with peppermint in tea which I am going to add to mine very soon. Thank you for sending those precious herbs and all your love with it. Love the bread, its texture , height and moreover the fact that you used fresh herbs in it. 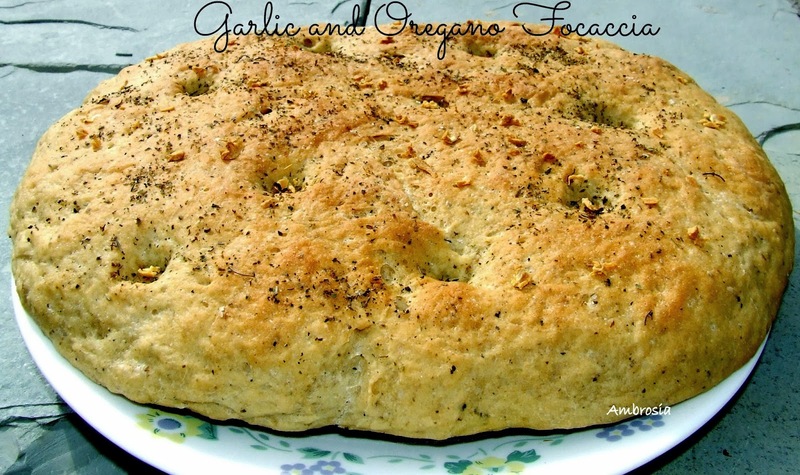 Omg, wat a fantastic focaccia, highly flavourful and addictive vegan bread..
That focaccia looks just awesome! I am so dying to make a trip to the hills to pluck fresh herbs! You lucky lucky you! :) Great use of the herbs here. I am definitely giving this a shot soon soon, but alas... using my shop bpught dry oregano! Hello, made this as my first bake for the new year. Lovely aroma in my kitchen. Replaced 1/2 cup with sprouted ragi flour and 2 1/2 cups with whole wheat flour. Rest the same as yours. Love the bread.